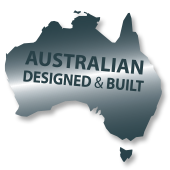 Australian designed and built, Radius Master belt grinding machines are the most versatile on the market. Radius Master belt grinders are proven to be the most invaluable tools for engineers, fabricators, welders, fitters, balustrade and stainless specialists, foundries, toolmakers, rural manufacturers, mechanics, restorers, aircraft engineers, medical equipment manufacturers, sculptors, knife-makers, model makers, many universities and the CSIRO. Radius Master machines are the only belt grinders available that are capable of accurately tracking the latest heavy duty polyester backed ceramic belts. Without the need for a box of add-ons and spanners, Radius Master belt-grinders are the most user friendly on the market that out-perform and out-last all competitors, making a significant improvement to your product costs and quality.